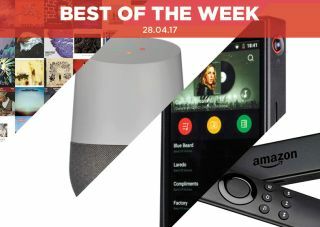 Best of the Week: Neil Young XStream music service, Google Home review and more | What Hi-Fi? This week both Onkyo and Pioneer updated a host products to include Chromecast and Google Home capability, Neil Young launched a new music streaming service and talking of which, a report found that revenue from streaming in 2016 grew by more than 60 per cent. Passing through our test rooms were Amazon's Fire TV Stick with Alexa, Arcam's rPlay streamer and FiiO's X5 3rd Gen portable hi-res player. Onkyo and Pioneer have released an update that delivers integrated streaming and voice control to some products. The update affects products in each brand's respective stereo, home cinema and network speaker ranges. It involves Chromecast compatibility as well as the ability to use voice-control for playback on Google Home and future Google Assistant devices. For more information on which devices get the update, click on the link. Neil Young has launched a new music streaming service called XStream. XStream, according to Young, is an "adaptive streaming service that changes with available bandwidth". In layman's terms it plays music at the highest quality possible, depending on your network conditions, similar to Netflix. Young hopes this will help differentiate it from the likes of Spotify and Tidal. However, there's no definite release date yet for the new service. According to the IFPI Global Music Report 2017, revenue from music streaming increased by more than 60 per cent in 2016. More than 112m people paid to stream songs as the global record music market grew 5.9 per cent in 2016. Revenues were a massive £12.24bn. The report also highlights how streaming helped offset a 20.5 per cent drop in music downloads and a decline of 7.6 per cent in sales of physical formats. Amazon Echo vs Google Home – which is better? "As the old saying goes, “If it ain’t broke, don’t fix it” "
Another year and another iteration of an Amazon product, this time it's the Fire TV Stick. The only significant addition is Alexa voice-control, which makes using it easier to use operationally (at least on Amazon's own apps). Amazon's philosophy of "if it ain't broke, don't fix it" means this is the same core idea as before, but with a few refinements and a significant drop in price. "The rPlay is the latest (and perhaps greatest) aid yet"
Arcam has a history of coming up with useful, affordable add-ons and the rPlay may be its best yet. It's a compact, easy-to-use streamer that can turn a traditional system into a streaming plug-and-play set-up. Throw in a solid performance and the rPlay presents a convincing case for anyone looking to go wireless without spending a fortune. "This player is definitely worth a look if you need to take your hi-res audio out and about"
Whether you're streaming or playing files locally, FiiO's latest portable hi-res player sounds good. However, it doesn't have the enthusiasm of other players and occasionally has an imprecise sound - two issues that mean full marks remain elusive. But for a well-built player with huge storage and access to streaming services, there's much to like about the 3rd Gen X5 player.